Soon, spring will be in the air again (at least here in the northern hemisphere) and plants are already getting ready for it. The image for March in our 2019 calendar is inspired by a protein that senses plant hormone signals to encourage growth. As the days get longer, and the air and soil warmer, plants prepare for another year. They sense these changes in the seasons and produce signalling molecules that control growth. These signalling molecules, also called plant hormones, can awake the plant from its winter sleep, trigger seeds to germinate and let the plant sprout, grow and bloom. Auxins were the first plant hormone group to be discovered and are major regulators of plant growth and development. The auxin family is one of five major types of plant hormones (the others are the gibberellins, cytokinins, ethylene, and abscisic acid). Auxins are involved in cell growth and cell expansion, so they are produced primarily in parts of the plant that are actively growing, especially the very tip of the stem. Therefore, although auxins can be found in all tissues of a plant, the concentration is highest at the top of the plant and decreases towards the roots. The plant can coordinate growth and development of different tissues based on the gradient of the auxin concentration. The auxin gradient directly affects processes such as flower initiation or fruit development. The higher concentration of auxin in the shaded side of the plant stem causes these cells grow longer, bending the plant toward the sun. Therefore auxins are also responsible for affecting phototropism, the process which allows the plant to follow the sun. 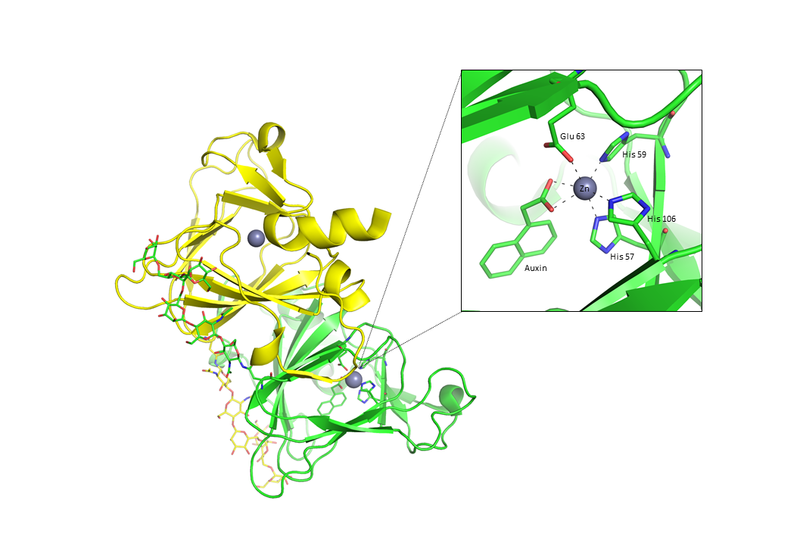 Structurally, auxins are derived from the amino acid tryptophan. They are composed of an aromatic indole ring and a carboxylic acid. The best known auxin is indole-3-acetic acid, but plants produce several other auxins, e.g. 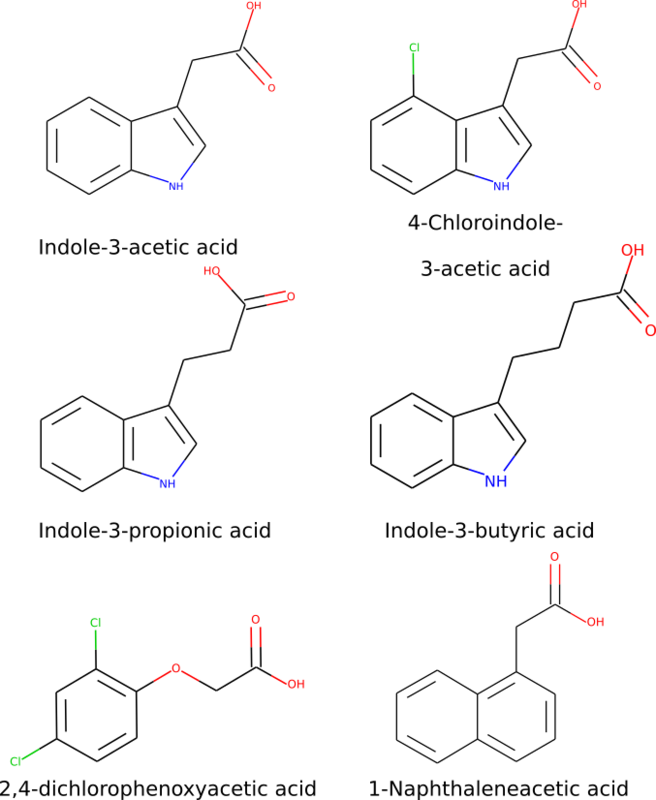 4-chloroindole-3-acetic acid, 2-phenylacetic acid, indole-3-butyric acid and indole-3-propionic acid. Auxins are not only natural products, however, with synthetic auxins also used to control plant growth. The auxin analogue 2,4-dichlorophenoxyacetic acid is used as a herbicide, causing uncontrolled plant growth and ultimately leading to the plant's death. Because it affects broad-leaved plants far more than it does grasses, it a common ingredient in lawn weedkillers. In contrast, 1-napthaleneacetic acid is used as a rooting agent, promoting root growth from cuttings. Auxin can only regulate a plant’s growth if the plant can sense its presence, and plants have a variety of different proteins which bind auxin, including auxin binding protein 1 (ABP1) (e.g. PDB entry 1lrh). While the exact role of ABP1 is unclear, it is thought that it functions as an auxin receptor and has an essential role in many plant developmental processes. ABP1 is a soluble 22 kDa glycoprotein found predominantly within the endoplasmic reticulum and in smaller quantities at the cell surface associated with the plasma membrane. The crystal structure of ABP1 (PDB entry 1lrh) shows that ABP1 has an auxin-binding pocket. This binding pocket is predominantly hydrophobic and contains a metal ion (zinc) coordinated by three histidines and one glutamate. Auxin (in this case 1-napthalene acetic acid) binds within this pocket with its carboxylate towards the zinc ion and its aromatic ring towards the hydrophobic residues. ABP isn’t the only auxin binding protein found in the PDB. Ubiquitin ligase (PDB entry 2b1q) degrades transcription repressors in the presence of auxin, allowing genes to be expressed. The seed globulin from Wrightia tinctoria (PDB entry 5wxu), acts as a food store in the seed and also stores auxin bound to it. Auxin is released as the protein is degraded, encouraging germination in the seed. So, as you see the green shoots of spring emerging from the ground, or a sunflower moving towards the sun, spare a minute to think what a complex biochemical process lies behind it. The structure of auxin binding protein (PDB entry 1lrh) was used as a template for the March artwork in our calendar. The image by Kitty Yarrow from Stephen Perse Foundation Sixth Form College, shows the concentric growth rings found in a tree trunk (brown/black) overlaid with the structure of auxin binding protein (light yellow).